In primary and secondary education, individuals are covered by the Individuals with Disabilities Education Act (IDEA) throughout their kindergarten to 12th-grade years. After high school, consider the IDEA null and void. At the college level, the Americans with Disabilities Act (ADA), subsequent 2008 amendments to the ADA and Section 504 of the Rehabilitation act of 1973 take over. What causes the drastic change in approach is that the IDEA is a Law of Entitlement, meaning it guarantees the success of students by urging teachers to do whatever is necessary to keep the student moving from grade level to grade level. The ADA, by comparison, is a Civil Rights Law that only guarantees a students access to reasonable accommodations that level the playing field for individuals with disabilities. In comparison, each student in primary and secondary school is entitled to Free and Appropriate Public Education (FAPE) in the “least restrictive environment” possible. When entering college, students must be “otherwise qualified” to enter college without the consideration of their disability(ies). Additionally, students in primary and secondary school would receive an Individualized Education Plan (IEP). 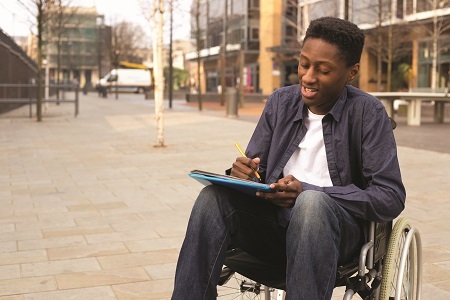 Colleges will look at old IEPs to help determine accommodations, but few institutions provide individualized plans for students with disabilities. Rather, accommodations are made with the help of the treating physician and the student. The most significant difference, and one that incoming students with disabilities and parents need to consider is that it is up to the student and/or parents to disclose their disabilities to the appropriate staff. Usually handled by the college’s disability-services department, administrators will not chase down individuals struggling in the classroom. If an individual received accommodations in primary and secondary school, it is advisable to disclose that information to staff before classes begin. Where students with an IEP would receive modified versions of a course, there are no curricula or content changes at the college level. It’s also important to note that teachers are expected to have an understanding of the disability in K-12 education. In college, an instructor is made aware of accommodations needed but not the diagnosis. Lastly, remember that ADA accommodations in college are meant to level the playing field. Students will be graded by the same standards as their peers. The means of assessment may be different, but the conditions do not change for any of the students. Moschini’s office makes sure accommodations are made for students through in-person interviews, documentation and evaluations and recommendations from the treating physician. Moschini notes that documentation and evaluations should not be from more than three years prior to entering college. This ensures that accommodations are helping a student’s present needs and not adhering to recommendations that may not longer be relevant to the individual’s condition. Once accommodations are determined, students qualify for them for the remainder of their four years at Muhlenberg. Moschini and her staff will also assist alums with the transition to graduate-level programs at other institutions. Muhlenberg’s Office of Disability Services will also find special housing and dining accommodations, facilitate accommodations for study-abroad trips and assist with temporary medical accommodations, if needed. Muhlenberg offers support services, tutoring, a testing center and a writing center, but beyond that, Moschini makes it clear that Muhlenberg does not offer special programs or services. Moschini is upfront with all prospective students because she wants to them to make the best decision for themselves, even if that means they don’t attend Muhlenberg College. “I want to provide them with information to carry forward in their search,” she says. At Moravian College in Bethlehem, Director of Academic and Disability Support Laurie Roth, M.Ed guides students through the process of transition from high school to college. She provides each student with a checklist detailing what will occur during the process to receive accommodations. It begins with the student or parents inquiring about the support center after visiting Moravian’s Academic Support Center website. Roth asks that the students provide documentation via email, fax or mail and sign a disclosure form for her staff to view the documents. After documentation is received, staff will review its contents and schedule an appointment to meet with the student in-person. Once the accommodations are discussed and agreed upon by students, Roth and possibly the parents, a letter of accommodation is issued to the student. It is his or her responsibility to make sure their instructors receive the letter. Moving forward, the student will have full access to all accommodations detailed in the accommodation letter. While the documentation needed depends on the disability, the disclosure form is consistent. Beyond that, Roth will guide individuals on what she needs to continue to help the student. Roth reiterates that the laws governing disabilities in higher education guarantee access, not success. In her 17 years at Moravian College, Roth has learned that a lot of a student’s success is dependent on their willingness to seek out resources in their first year of college. Roth and her staff will gladly assist students with study skills, time-management skills and refer them to support, when needed. Unfortunately, because some students do not seek help right away, Roth doesn’t begin to hear from a student until they are already struggling. Professors are able to refer students to the academic support center, but ultimately, it is up to the student to seek out the needs pertaining to their condition. Moravian also provides testing centers, support and unending resources, like faculty that are eager to help. At Moravian College, after accommodations are arranged and documentation has been made, students with physical impairments will not have to resubmit each school year or semester. For those with mental-health impairments, new documentation needs to be resubmitted every year to monitor changes in status. If an accommodation is not meeting the needs of the student, it’s vital to let assisting staff members know as soon as the student is aware. If the student waits until a semester is over, a class is finished or an activity has been completed, it may be too late to get the resources needed. The point is to avoid failing classes, having to retake classes or being removed from a program. It is illegal for an institution to charge students with disabilities more for programs or activities as well as for needed academic adjustments. It is imperative that students and parents know their rights and what actions are available to students with certain needs. It is also illegal for institutions to ask about disabilities and impairments in the application process. “You have to admit students based on the general criteria that you would look at for a student you would accept, regardless of disabilities,” says Roth. To learn more about disabilities in post-secondary education, visit the U.S. Department of Education’s website. Look for that perfect fit. Parents and students are encouraged to research policies and programs at prospective institutions. Visit their website and review their disability-services guidelines to determine if the school is a good fit for the student’s needs. Moschini says that sometimes a wealth of information available online or the lack thereof can be an indicator of that school’s programs and policies. Roth asks students to be their own self-advocate. She also urges students not to wait until classes begin to start exploring resources.A student’s journey through college is difficult enough; utilizing resources, seeking help and understanding individual abilities can make the transition much easier, as well as the next four years. Do research, and make the best decisions based on the needs of the individual. For more information on the policies and programs at Moravian College, visit moravian.edu/disability-support. For more information about Muhlenberg College, visit muhlenberg.edu/main/aboutus/disabilities/.